Help him clean up nicely with this tuned-up set of manly salves, scrubs, and balms. 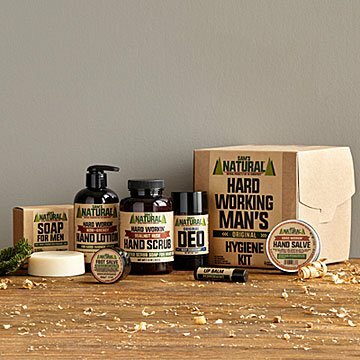 This all-natural set was created by a mechanic who let dirty, damaged paws drive his inspiration to design products for dudes. The manly salves, scrubs, and balms included are specially made to meet the needs of the working man. From soothing sore feet, to healing cracked lips, to buffing the dickens out of dry skin, this kit goes beyond simple cleansers to get the job done. This kit is a carefully refined version of our previous kit, featuring new and reformulated items. Handmade in New Hampshire. Peppermint Lip Balm 0.2 oz. Store at room temperature away from direct heat, sunlight or excessive humid environments. Contains: Natural Butters (Shea, Mango, Cocoa), Natural Oils (Olive, Almond, Macadamia, Meadowfoam), Emulsifiers. The Real Men Need/Want But Won't Shop/Ask For! The perfect gift for that 1 male relative who has everything and would never buy these products even if they were on special athe hardware store but needs them all! Disappointing! Cardboard box with small sample size products Way too expensive for what you actually receive! Disappointing! My husband uses the products he received for his birthday everyday. Very wise choose I made when I was shopping around for a different type of gift for him. These smell wonderful! Not harsh on the body and there's no residue on your clothes. Product smells great! My brother is obsessed with his new manly regime kit. He uses it every morning now! Great item to get the working man! Just overall a fun little bit of pampering for any man. Packaging and presentation are unique. I'm excited to see how he reacts when he uses this product and soothes his tired hands. My hardworking 26 year old son doesn't treat himself to fancy bath "products," but he loved this set, especially the hand lotion, which he would have never bought on his own!